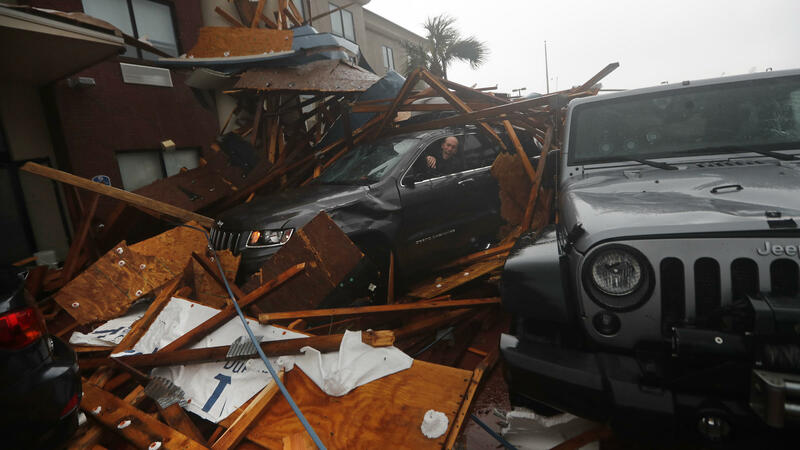 Downed power lines, shredded trees, derailed train cars and a sunken trailer are seen Wednesday in the aftermath of Hurricane Michael in Panama City, Fla.
A storm chaser climbs into his vehicle as the eye of Hurricane Michael passes over Panama City Beach, Fla., hoping to retrieve his equipment after a hotel canopy collapsed in the parking area. The storm came ashore as a nearly Category 5 hurricane Wednesday. A truck drives along a washed-out road as Hurricane Michael's storm surge and winds come ashore in Alligator Point, Fla., Wednesday. 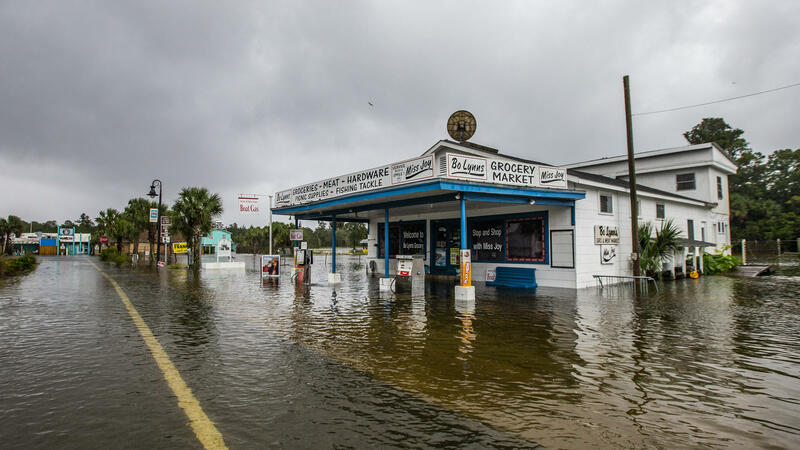 Bo Lynn's Market was taking on water in the town of St. Marks, Fla., on Wednesday, ahead of Michael's landfall in the Florida Panhandle. The hurricane struck land first as Category 4 storm. 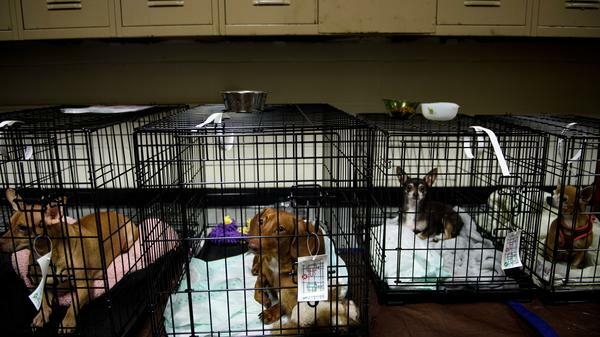 Pets sit in a shelter in Panama City, Fla., as Hurricane Michael approaches the area on Wednesday morning. 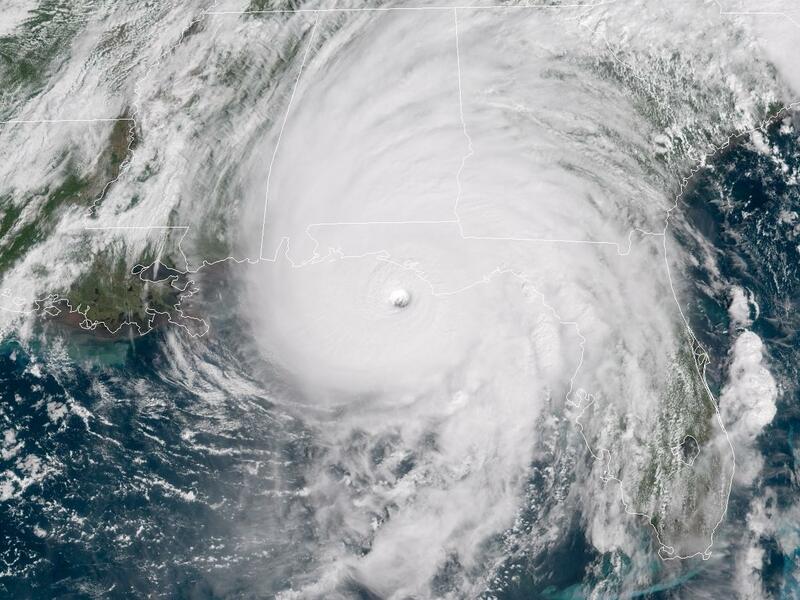 Hurricane Michael, seen here as it neared the Florida Panhandle around noon on Wednesday, is the strongest storm to hit the area since records were first kept. Tropical Storm Michael is weakening as it churns across south-central Georgia. On Wednesday, Michael was the strongest hurricane to make landfall in the continental U.S. in more than a quarter-century, according to the National Hurricane Center. At least one person has died from complications related to the storm. Gadsden County, Fla., Sheriff's Office spokeswoman Anglie Hightower told NPR the man was killed after a tree fell through the roof of his home. 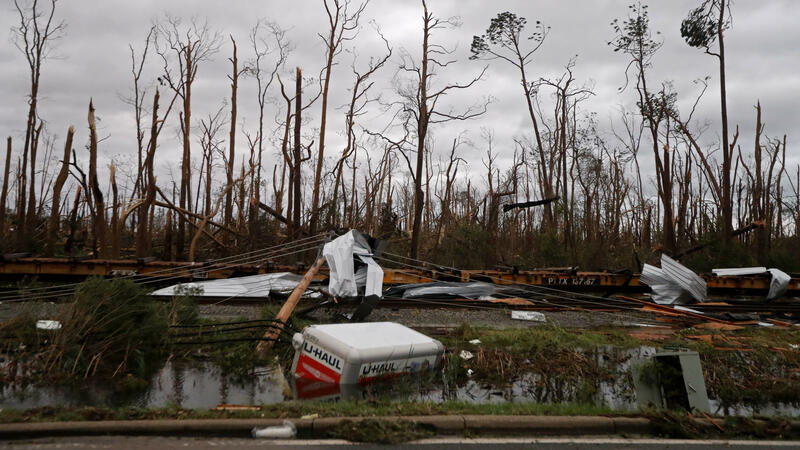 In the latest update, forecasts say early this morning, the eye of Michael was about 90 miles northeast of Macon, Ga., and 45 miles west of Augusta. The storm's maximum sustained winds have decreased to 50 mph and it was moving to the northeast at 21 mph. The National Hurricane Center says the core of Michael will move across eastern Georgia into Central South Carolina on Thursday morning. It will then move across portions of central and eastern North Carolina and southeastern Virginia into the Atlantic Ocean by late Thursday or early Friday. Three to 6 inches of rain are called for in Georgia, the Carolinas and into Virginia, which could create what the hurricane center stresses would be "life-threatening flash floods." The meteorologists have reported that winds gradually are decreasing over the Florida Panhandle, with storm surge levels beginning to decrease along the Gulf Coast. Storm surge warnings are still posted from Panama City to Keaton Beach, Fla.
Not since Hurricane Andrew has a storm clobbered the coast with the same ferocity as Michael slammed the stretch between Mexico Beach and Tyndall Air Force Base on Wednesday. It is also the first Category 4 storm to hit the Florida Panhandle since records were first kept in 1851, said NHC Director Ken Graham. "This is definitely [and] unfortunately a historical and incredibly dangerous and life-threatening situation," he added. As Michael stormed ashore, President Trump discussed the threat with Homeland Security Secretary Kirstjen Nielsen and FEMA Administrator Brock Long, during a meeting at the Oval Office. Seated in front of charts depicting the storm, Trump said he had had a "long talk" about the hurricane with Florida Gov. Rick Scott. Appearing at a White House event moments later, Trump said federal agencies are poised to help state emergency officials as they cope with the need for food and other aid. "This started out very innocently a week ago," Trump told reporters. "This was a small storm in an area they never thought this [would come from]. And it grew into a monster." Angela Fritz of The Washington Post's Capital Weather Gang explained how the hurricane escalated so quickly. "We're seeing stronger storms because the sea surface temperature — the ocean water — is so much warmer," she told NPR's All Things Considered. Climate scientists have said that this warmer water, which is driven by climate change, is driving larger, more intense storms in turn. "We just don't quite have the knowledge available to us in the equations available to us to predict exactly when and how it's going to intensify," Fritz added, "and we need a lot more research to understand exactly when that will happen." For now, though, Trump had a simple message: "God bless everyone, because it's going to be a rough one." Not long after his conversation with Trump, Scott formally requested that Trump issue a major disaster declaration for Florida. The request aims to expedite the process for obtaining federal aid. Scott said that as of Wednesday afternoon, state agencies had already spent nearly $40 million on response costs alone. Even before the storm made landfall, Florida officials said roughly 30,000 people had lost power because of the hurricane. Authorities have warned of the possibility of isolated tornadoes throughout the night as far north as the Carolinas. More than an hour before landfall, hurricane-force winds of above 75 mph were being reported in Apalachicola, Fla. Water quickly and steadily rose along the coast: A weather station in the small Gulf city reported flooding at 6.5 feet above ground level. High winds also forced officials to close several bridges in Bay County. "We've issued our first ever Extreme Wind Warning," the National Weather Service office in Tallahassee said in a tweet, as the storm approached. Noting that the warning means winds in "excess of 130 MPH are expected," the agency urged people in the area to take shelter "immediately." Flooding started late Tuesday and early Wednesday in some areas; the NWS office in Tallahassee posted a photo of a building near Panacea, Fla., with water seeming to cover its lower third by around 6:30 a.m. local time. With the storm powering toward the coast, the Weather Channel's Mike Bettes said he and his crew were leaving Apalachicola, adding, "Better safe than sorry." The growth and continued low pressure led NHC scientist Eric Blake to call it "a near worst-case scenario for the Florida Panhandle." With the storm on Florida's doorstep Wednesday morning, Scott told residents "it is not safe to travel across the Panhandle. [If you are in a coastal area], do not leave your house. The time to evacuate in coastal areas has come and gone." 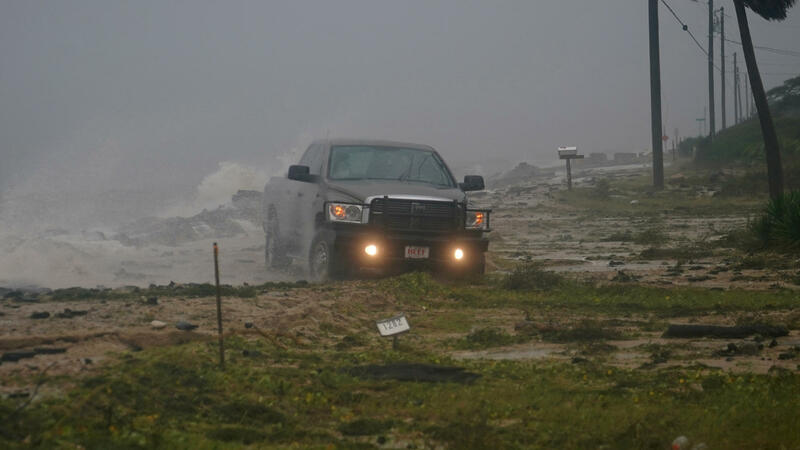 Those farther inland, Scott said, might be able to seek shelter if local officials say it is safe. Otherwise, residents should prepare to endure the storm at home. "The worst thing you can do now is leave and put yourself and your family in danger," Scott said. There are 54 shelters open across the Panhandle and Big Bend areas, Scott said, with a population of nearly 7,000 people. He added that more than 1,000 search and rescue personnel will be deployed after the hurricane passes through. "We have trucks loaded with tons of food, water and other critical supplies, ready to move in," Scott said. Hundreds of miles of coastline were under storm surge, hurricane and tropical storm warnings. A tropical storm warning reached as far north as Duck, N.C., near the Virginia border. In the aftermath of the storm, with downed trees and utility lines, Graham said, "You have to stay away from those power lines. If you have trees down, it's not the time to start learning how to use that chainsaw." People should also keep their generators outside, he added, to avoid being overcome by toxic fumes. In Georgia, Gov. Nathan Deal expanded a state of emergency Wednesday to include 108 counties. Earlier in the day, he activated 1,500 Georgia National Guard troops to be ready for emergency response, though as yet no mandatory evacuation orders are in place in the state. "This is a dangerous, dangerous hurricane and I urge those in Hurricane Michael's forecasted path to be prepared, stand vigilant, and be ready to help their neighbors," he said. In Georgia, many people are afraid for their lives but also for their livelihoods. As Georgia Public Broadcasting's Stephen Fowler reports, farmers in southwest Georgia fear that the hurricane will wipe out their crops before they manage to harvest them. "You have thousands and thousands of acres, and you can't get it all," said Roslyn Palmer, who is on the city council for Bainbridge, Ga. "Something that would take four to six weeks — you can't get it in four to six days." Meanwhile, South Carolina remains under state of emergency due to flooding the most recent massive storm to batter the state, Hurricane Florence. "While we will not see the full force of Hurricane Michael the way Florida will, we could see gusty winds, rain, flash flooding and even tornadoes," South Carolina's emergency management director, Kim Stenson, warned Wednesday. "Over the next day, it will be vital for everyone to be prepared to act if told to do so by your local public safety officials." North Carolina Gov. Roy Cooper also issued warnings of his own Wednesday, declaring a state of emergency and urging people to get ready: "Make no mistake," he said, "Hurricane Michael is a dreadful storm, and it poses serious risks to North Carolina." That echoes sentiment also voiced by Fritz of the Capital Weather Gang. "It's going to have a devastating impact on the coast and well inland," she said Wednesday. "But I also just want to make sure that people in the Carolinas and southeast Virginia are aware that this is a storm that will affect you, too."